The sons of Al-Qanaos district in Hodeidah province on Sunday organized a protest to denounce the violations of the coalition’s forces for a cease-fire and their lack of commitment to implement the Swedish agreement. The participants stressed the persistence of steadfastness in confronting the coalition’s forces and funding the fronts with money and men until victory is achieved. The participants condemned the continuation of the coalition in committing crimes in Hodeidah, the unjust siege imposed and prevent access of food, medicine and humanitarian aid to the people of the province and other provinces. The participants called on the United Nations, represented by its UN envoy, to do its duty to stop the violations and crimes committed against the people of the province in flagrant violation of the ceasefire. As well as the sons and tribes of Qahri in Bajel district on Sunday organized a mass protest to reject and denounce the escalation of coalition. 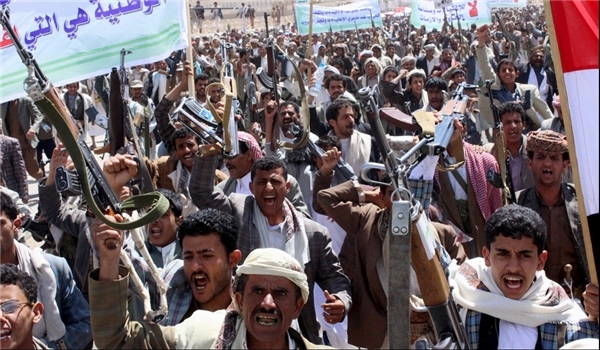 They also declared their willingness to confront any plot on the West Coast in particular and Yemen in general. The participants in the stand stressed the steadfastness in the face of aggression. The participants condemned the international community’s complicity and stigmatization towards the crimes of the Saudi-led coalition and its daily massacres against the Yemeni people. They condemned the violations of the ceasefire and the delay in the implementation of the Swedish agreement in an attempt to foil it.